Huai Khwang, or Huay Khwang. Essentially this is the heart of Bangkok. 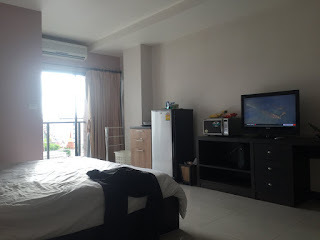 I've rented a room for a month at around 15,000 Baht, or something in the range of 450 a month in terms of US Dollars. Try to do that in Palm Spring, CA. The room is not bad. It's basically a large studio. There's a fridge, a hot water maker, AC and other niceties. As of today, they brought up a drying rack and also a microwave. If you notice, there is no kitchen. This is because no one really cooks in Thailand. You go downstairs, and you have a street food scene that will make any Angelino cry as it is impossible to do in Los Angeles with its regulation of street vendors. Late at night, the area is teeming with activity. Street food galore. In fact, this scene is pretty intense and the level of commerce at the street level is astounding. It is more impressive from the window of a taxi. What does it mean? There are reasons why Thailand has been designated as one of the better places to retire. Well, if you have sufficient funds, you could make this work. Let's say you want to rent a place. For one month, the rent is 15,000 Baht. But that could go down as low as 8,000 Baht a month which is under 300 US dollars for a full year commitment. So, finding a home base is actually not too bad. Vietnam is comparatively more expensive, and you are out of luck eating past midnight, as the curfew engages at that time. These are things that you have to consider. Huai Khwang is a fascinating area. It is where the real Thais live. Unlike Sukhumvit, or Thong Lor, you would be hard pressed to see a Westerner. There are Chinese, but the Chinese are everywhere.